Kids pirate party supplies and pirate party items for a swashbuckling good time! The coolest kids pirate party supplies and fun pirate party items for your little buccaneer. If you need kids pirate party supplies you've found the right place. 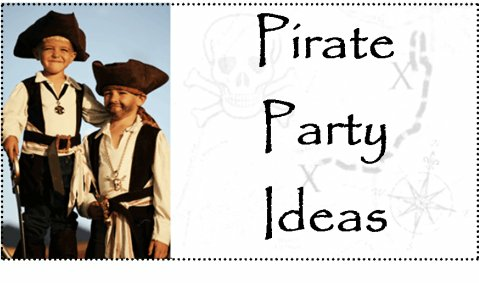 Here you can find pirate party items for every budget to help throw your kid an awesome pirate theme party. Hopefully you've already found the perfect party games. If not I have tons of creative party games to fit your kids pirate party from the D.I.Y, creative, budget friendly, and pick and click to purchase. Go to Pirate Party Games to browse. This is the basic kids pirate party supplies kit from my favorite party supplier birthday in a box. You get everything listed for only $21.99! This basic kids pirate party supplies package for 8 guests includes Pirate Party plates, cups, napkins, a table cover, cutlery, streamers, and candles. Our Deluxe Kids Pirate Party Supplies Box includes everything you need to throw the perfect party for your little one and 7 guests! Contents include full tableware for 8, a variety of Pirate party decorations, and birthday candles. If you want to go ALL OUT check out the ultimate pirate party kit. It's 134.99 and it comes with EVERYTHING! Our Ultimate Kids Pirate Party Supplies Box includes everything you need to throw the perfect party for your little one and 7 guests! Contents include full tableware for 8, a variety of Pirate decorations, birthday candles, and fun items for your guests. Even More Kids Pirate Party Supplies to give you a variety of pirate party items to choose from. Decorate the party area with a Pirate Party birthday banner featuring a "Happy Birthday" message and images that coordinate with our Pirate Party supplies. Ages 3 and up. I hope you found everything you were looking for. If there is any kids pirate party supplies that you are searching for let me know. I am always adding new, fun, and affordable pirate party items and need to know exactly what your looking for.